Tonight I was lucky enough to be invited to the opening of the new Melissa flagship store in Sydney Central Mall in Pitt Street. I've been a fan of Melissa shoes for a long, long time, buying my first pair in Tokyo many years ago. My love of all things jelly on my feet has been well documented on this here blog so I was excited to see the new store and the new collection in person. Can't say that I was disappointed I walked away with an awesome pair of red flatforms which will be blogged soon enough. As it was the opening of a Melissa store I of course wore my fave pair of pink Melissa jelly flats which conveniently matched my new H&M x Martin Maison Margiela pink foil candy clutch that I was lucky to find on ebay for only double the retail price. I had friends stationed around the world in H&M cities trying to locate one for me when the collection dropped but it sold out so fast it looked like I was going to miss out. Of course ebay was full of them, which was disappointing as the sellers were obviously trying to cash in but then it worked out great for those of us living in countries that don't have H&M stores (yet). I love it so much! What is it with tights and collecting dog hair? Gotta love the whole pink foil touch! I love how radiant and still punk-ish you look! Oh Hayley, you're just so great! Guh! I am so in love with this outfit, I think it may be my favourite of yours yet. I just fall more and more in love with your style everytime you've posted your outfits lately! So in love with that clutch!! Love, love the pink foil skirt so much, and your whole attire is so unique. i am OBSESSED with this look. so good. awww sweetest outfit ever! 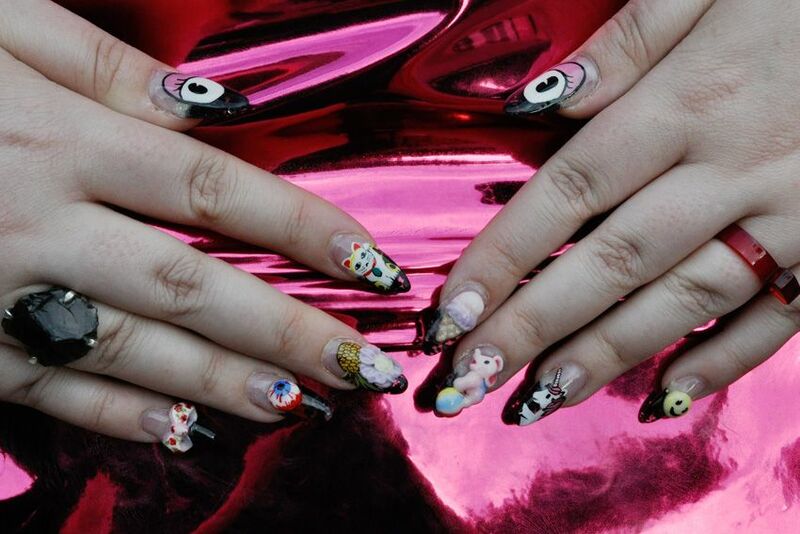 and i love those nails! The necklace is FAB! I must check out Fashiondacci (I have their address on a post-it not from one of your previous posts). I love this outfit! And your nails are awesome too! Me encanta el metalizado, es tan maravilloso y tus uñas que hermosas. woooow. Gracias por compartir. Quiero invitarte a ver mi ultimo shooting Filthy Andy, muévete a verlo. Besos y besos. So funny how popular Melissa shoes are now here in Australia. I remember owning so many pairs when I was little in Brazil. They didn't smell as nice as they do now with their gorgeous scents but they lasted a long time. Love the colour of your Melissa sandals Hayley. Your bag looks like a candy bar - that is so cool. The pink color is looking so sweet on you.Classic outfit. Oh my I LOVE your nails!!! 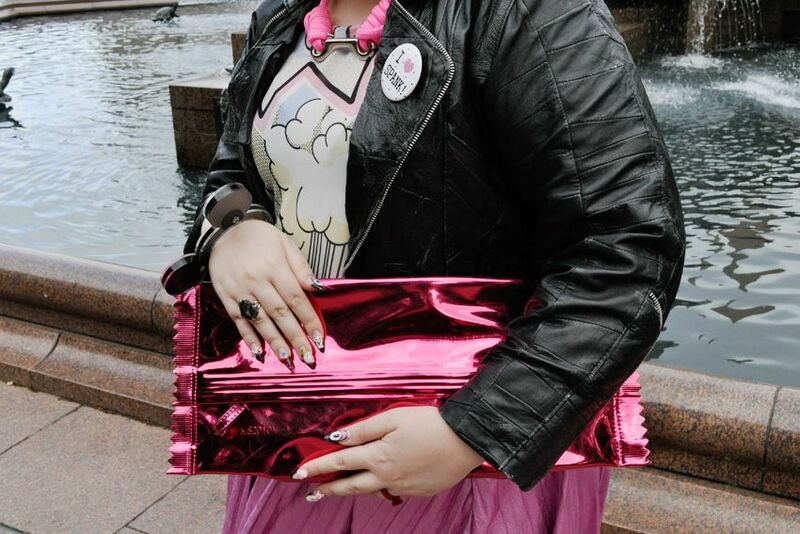 I love everything about this outfit, and would chop my arm off for that bag! !